Belle Skinner was a humanitarian and music-lover whose life her brother William memorialized in the construction of the Skinner Hall of Music at Vassar in 1932. Belle Skinner, née Ruth Isabel Skinner, was born in Skinnerville, Massachusetts, in 1866. Her family was wealthy and owned Skinner & Sons, a renowned silk and velvet manufacturing company based in Holyoke, Massachusetts. After attending Vassar College Preparatory School, Skinner attended Vassar College (as did her two older sisters, Nancy and Elizabeth) and graduated as class president in 1887. During and following World War I, she became interested in contributing to the war relief effort in France, purchasing large quantities of clothing, shoes, and money for this cause. In 1919, driving through the ravaged eastern French countryside, Skinner decided to adopt the ancient medieval town of Hattonchatel (population 250), whose infrastructure had been almost completely destroyed during the war. Working through the French government, she financed and oversaw the reconstruction of Hattonchatel, from the rebuilding of the chateau, town hall, library, and school, to the installation of a modern water system. Skinner also spent much of the year living in Hattonchatel, where the townspeople called her “Marraine”—“godmother.” Skinner spent a total of $1 million in the restoration of Hattonchatel. She also became the president of the American Committee of Villages Libérés—a French relief organization—working towards the reconstruction of other devastated villages in eastern France. For her humanitarian efforts the French government bestowed upon her the Médaille de la Reconnaissance Française in 1919, and in 1920 the Consul-General of France presented her with the cross of a Chevalier of the Legion of Honor. In 1926, Skinner established a $10,000 scholarship for Vassar graduates to study history in France—Vassar’s first fellowship for foreign study. 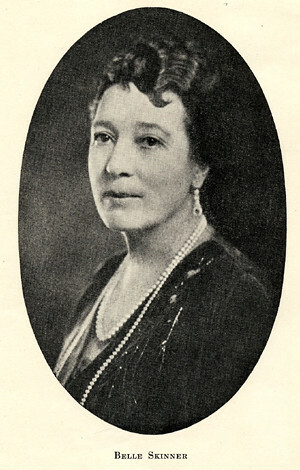 Following Skinner’s untimely death from pneumonia in 1928, her brother William Skinner increased the fellowship to $25,000. He also created two other fellowships in Bible Studies and Biology to honor his two other sisters and their areas of concentration at Vassar. Classical music had been Belle Skinner’s lifelong passion, and at the time of her death she had amassed a large collection of instruments from around the world. Originally housed at the Wistariahurst Museum in Holyoke, the Skinners’ former residence, the collection is now part of the Yale University Collection of Musical Instruments. Inspired by his sister’s love for music, William Skinner gave the Belle Skinner Hall of Music to Vassar in 1929. Architect Charles Collens designed the building, and musicologist George Sherman Dickinson designed its interior. Belle Skinner Hall was completed in 1932. In keeping with Belle Skinner’s commitment to Hattonchatel, the building was executed in the medieval French Gothic style; the concert hall inside mirrors the Loire Valley style of the ancient town that she reconstructed. Belle Skinner's family home, Wistariahurst, in Holyoke, Massachusetts, is maintained as a museum and cultural center. For her restoration work in Hattonchâtel Belle Skinner is included among Vassar's many innovators. “Belle Skinner collection of Ancient Musical Instruments.” Vassar Quarterly. May 1934. “Belle Skinner Dies on Visit to France.” New York Times. 10 April 1928. Daniels, Elizabeth. Main to Mudd, and More. Poughkeepsie: Vassar College, 1996. 58. Forrest, Wilbur. “Rich American Woman Adopts and Entire French Village.” New York Tribune. 7 November 1920. “Miss Belle Skinner.” Holyoke Transcript. 10 May 1926. 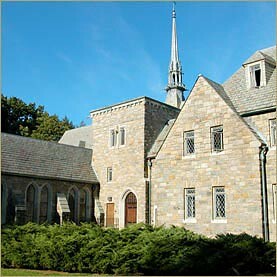 “Skinner Memorial Given to Vassar.” New York Times. 13 November 1929. Vassar Miscellany. 9 July 1926.